Travel theme: Tangle | Oh, the Places We See . . . Immediately upon seeing the challenge word that Ailsa of Where’s My Backpack selected for this week’s Travel Theme — Tangle — we thought of one of the first sights we saw in Nepal. In 2011, when we journeyed with our group to that country to build houses for Habitat International, we stayed in the Thamel District in Kathmandu. Naturally, we wanted to do some shopping in that teeming, crowded, exciting district. But we were unprepared for what we saw tangled around poles on every street corner: wads and wads of wiring! No wonder blackouts were common even then. And there’s no telling what this scene is like today after the April 2015 earthquake. Even more tangled, probably — and in more ways than one. To get even more tangled up, click here to view all the postings for this week’s Travel theme: Tangle. 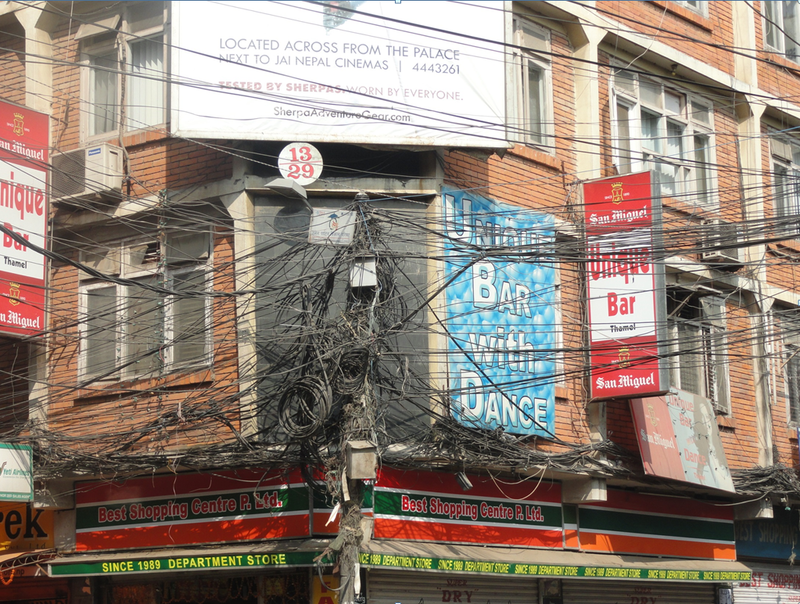 This entry was posted in Nepal, Travel Theme and tagged Kathmandu, Nepal, tangled, Thamel District, Travel theme: tangle, wiring. Bookmark the permalink. LOL. . .. I have seen this so often in India! We saw this in India also, but it was quite pronounced in Kathmandu. Have no idea how the folks in either country manage, but they do!!! Wow, hard to imagine even more wires than are put up in India. Amazing! You are so right, Curt. I don’t know how fires are avoided. And now I’m wondering if any of the poles survived the earthquake. Definitely problematic. Thanks for taking a look. That is indeed a tangle. Good luck for the maintenance people! Marion, you are so right — good luck. I really don’t know how they know which tangle at which pole is the culprit when power goes off. They all look like this. We saw lots of wiring like this in Cambodia!! Now that’s a place I want to see. It could be that many countries are like this. We just hadn’t seen it before. Judy, you’re doing the same thing I did — comparing notes on the two countries. But no matter how bad we think we have it, someone else is worse off. Thanks for commenting. Best wishes for a good week ahead. Oh my goodness! Mind you, Cuba was similar…. I’ve heard that many countries have infrastructure that barely supports what we know as essentials in the U. S. I don’t know how they manage, quite frankly. Thanks for commenting. Crazy, it’s interesting how uptight we are all. Thanks for visiting the site. Happy Memorial Day! Growing up in America, where we are very careful about wiring, seeing that total tangle of wires from Nepal was a shocker! I sometimes forget how different America is from so many areas of the world. Carol, you are so right. Our country is very different from so many third world countries. We take for granted so many things. And travel helps us connect cultures, impressions, realities, etc. Thanks for commenting.